A Day In The Life Of A Bodybuilder! 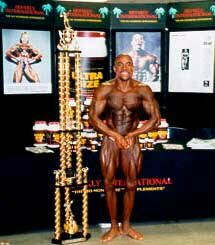 In this article I will detail a typical day my life as a bodybuilder preparing for a competition. Some details may be left out since I don't want to bore you to death!! In this article I will detail a typical day my life as a bodybuilder preparing for a competition. Some details may be left out since I don&apos;t want to bore you to death!! Eight weeks to go before I take the stage for a competition that I decided to prepare for two weeks ago. I start first by making a self-evaluation. How much body fat am I carrying? When do I need to start intense cardio? What is the proper diet at this point? What is my competition doing to prepare? Will they be as committed as me? Will I be committed enough? How do I train now? Most of all, do I have what it takes to win? All these questions constantly are revolving in my head making it ache with pain. I wake up each morning and my first thought is standing on that stage. I leap out of the bed at the sound of my alarm. It&apos;s 5:00 am. I head to the bathroom to sh**, shower, and, shave (in no particular order). I then get dressed. After putting on my clothes, I grab my gym bag that I careful packed the night before. As I head down stairs for breakfast, I mentally itemize each of the items in my gym bag so that nothing is left behind (shorts, tank, shoes, socks, radio, gloves.....). Once I&apos;m downstairs, I begin to prepare the first meal of the day. It&apos;s 5:30 am. Meticulously, I measure each portion of meat (chicken, turkey, beef), eggs whites etc.. as it conforms to the diet I have decided to pursue. Hmmmmmm.....tastes so good after fasting all night long. Next, its time to take the first supplements of the day (multi-vitamin, protein, thermogenic etc.) The last thing is a cup of coffee to drink (I love coffee!!) during the 25 minute drive to the office. I also grab my pre-packed lunch that I prepared the night before. Out the door by 6:00 am!!! I arrive into my office and log on to my computer by 6:30 am and start down the list of tasks I recorded in my organizer. The hours go by and I begin to lose that "rush" that set me out of the "blocks" this morning like a bullet. I start to feel the hunger from the diet cravings already. I constantly check the clock on my computer, as I slave away, anticipating that second meal of the day. Each minute seems to take an eternity until finally its 9:00 am!!! Time to eat. I rush to the break room, grab my packed lunch and remove the Tupperware containing 9 oz. tuna with 3 egg whites I prepared last night. For dessert, 1 sliced grapefruit or tomato depending on my mood that day. Hmmmmm....delicious I murmur as my mouth begins to water. I rush back to my office to eat. I begin to eat slowly and savor each and every bite, trying to control the urge to wolf it all down at once. Hmmmm...tuna never tasted sooooo goooood! At the end of the meal, I take my protein, dissected liver, and multi-vitamin with water. The mid-morning meal energized me for the remainder of the morning and again, as I sit diligently in a meeting with a customer, I start to feel the insatiable hunger I have not gained tolerance for yet. It is much more pronounced this time. I start to almost smell that baked chicken waiting for me in my packed lunch. It&apos;s been delicately seasoned with barbeque mesquite. A whole 8 oz. portion is sitting there waiting for me!!!! Finally, the meeting concludes and I wrap up my last minute notes. Pleasantly, I bid "good day" to my customer and head for the exit. I have a look of focused determination on my face. Some interpret the look as "He&apos;s late". I am late, but for my 12:00 noon meal! It&apos;s 12:10 before I realize it. When I make it back to the office, again, I head to the break room and grab the 8 oz. chicken container and slam it into the microwave. I only need to heat it since I baked a huge batch on Sunday evening. I also grap a 4 cup container of salad. I prepare the salad with 2 tablespoons of Cider Vinegar. "Ding", the sound is heard as the microwave is done. I grab the chicken, salad and rush to my office. On the way, I stop at the water cooler to get some water. As I begin to eat I enjoy the delicious aroma of the barbeque mesquite chicken that I played in my head for the past 3 hours. Hmmmm...another delicious meal. At the end of the meal, I take my protein, dissected liver, and multi-vitamin with water. I enjoyed the lunch and soon after started back to work re-energized. As the mid-afternoon progresses, slowly I might add, I take mental breaks periodically and visualize that evenings work-out. During each mental break, I visualize myself doing a different exercise with great intensity for the body part being trained that day. It&apos;s so visually "real" that I almost perspire. The final hours continue on like this. Again, I notice that nagging feeling of hunger again and look up to find that its 3:00. Whoooooopie!!!!! I shout in my head and bolt for the break room for my last meal before training. This time I&apos;m having an 8 oz. portion of lean beef with 2 cups salad. For dessert, sugar-free Jell-O!!!! Also, don&apos;t forget to grab the water....I mumble to myself. I&apos;m beginning to feel water-logged and can almost feel water swirling in my stomach. I heat up the beef in the microwave and when it&apos;s done, I head to the office to eat! This time I only have to heat it since, like the chicken, I prepared a batch Sunday evening. When finished, I again take my protein, dissected liver, and multi-vitamin with water. This time I add L-glutamine and a thermogenic before heading to the gym. Finally, 4 pm rolls around. Another 10 hour work day done! Now, it&apos;s time to hit the gym. Before leaving work, I make record of tasks completed and assigned in my organizer. Out the door at 4!!! As I drive to the gym, I again replay in my head today&apos;s training routine. I want to make sure I waste no time and know what I am going to attack! I arrive at the gym and am changed and ready. It&apos;s 4:25 pm. With a gallon jug of water in hand, it&apos;s time to "IGNITE". My intensity is just as I visualized in my head. Another fantastic work-out, I think to myself. So good that I finish it by 6:25 (including cardio and abs, if done that day). I&apos;m starting to feel the fatigue and hunger. Time to head out. As I head home, I try to think of a different order of exercises to try for that body part next time. I arrive home at 7pm and head straight to the kitchen. I&apos;m having 10 oz. of that delicious barbeque mesquite chicken breast and 2 cups green beans or salad. Yummmmmmmy. With dinner, I pour a glass of pink lemonade crystal light or sometimes a can of 1 calorie Pepsi One!!! This helps get more precious fluid into my system. After eating, I flip the T.V. to a basketball game that is already in progress. While the game is playing, I go to the kitchen and position myself so I can still view the television and begin to prepare my lunch for the next day. Out of the fridge I pull out all the things I have previously cooked. Chicken breast, lean beef, egg whites, salad, etc... Also, I grab a serving of the sugar-free Jell-O. Next, I reach into the cabinet for two cans of tuna. I&apos;ve finely tuned this lunch preparation and it takes a total of about 20-25 minutes to complete. Not bad considering it will provide 4 complete meals the following day. Game is still playing and it&apos;s half time. I look up and it&apos;s 7:45 pm. Time to practice posing. I already have a mirror set-up, next to the T.V. (of course!). I begin posing starting with my facing movements holding each for two minutes, face-front, quarter-turn to the right, face-rear, quarter-turn to the right, and face-front. Now, I begin my mandatory poses holding each for one minute. Front lat-spread, front double-bicep, side-chest, side-tricep, rear double-bicep, rear lat-spread, other side-chest, other side tricep, abdominal and thigh, and the grand Most Muscular!! This takes a total of 20 minutes. As weeks draw closer to the competition, I will increase posing practice to a full hour (I may break it into two 30 minute sessions, if needed). By now, I&apos;m almost ready to eat my sixth and final meal. First, a little down-time. You guessed it! I will have a seat and watch the final minutes of the game. The game has concluded and I&apos;ve fully relaxed into a somber. It&apos;s 9:00 pm and one last thing to do, make my last meal of the day. Something special this time. For my last meal, I will have 4 servings of egg beaters (1 cup) and about 4 slices of turkey bacon. Equates to 200 calories, 6 grams fat, 4 carbs, 40 grams protein. Also, I&apos;ll have a small glass of red wine (yes!! wine) to wash it down. Red wine has very important positive qualities in relation to your good cholesterol levels. It also helps to promote a good nights sleep. Try it, if your old enough and can drink wine. After eating my gourmet meal, I take 3 ZMA, Vitamin C, and Dissected Liver and head for the bed!! As I head for the bed, I&apos;ll take a low-carb protein bar. I don&apos;t intend to eat it unless I wake during the night and feel hungry. In bed by 9:30!!! Another day in the life....Good night... ZZZZZZZZZZZZZ.